Transferring to the West End from the Menier Chocolate Factory, Trevor Nunn’s faithful production of Bock, Harnick and Stein’s musical retains its sense of intimacy and pertinence. Designer Robert Jones has made a shtetl of the reconfigured Playhouse Theatre. The small stage is crammed with rickety wooden houses and wintry trees. The set carries into the auditorium and a ramp curls through the stalls, allowing the audience to get up close to the inhabitants of Anatevka. 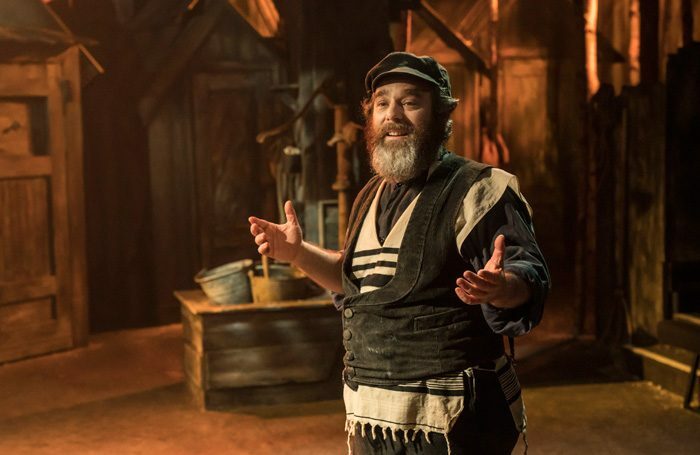 As put-upon milkman Tevye, Andy Nyman doesn’t have the most striking of singing voices, though he can let rip when he needs to, but he brings a winning mixture of warmth and weariness to the role. He creaks his way appealingly through If I Were a Rich Man and his eyes glitter with love for his daughters even when they’re a source of torment to him. Judy Kuhn, as his wife Golde, is, if anything, even better – sharp but soft, her voice full of tenderness. Their duet on Do You Love Me? is delicate, moving and suffused with a sense of the shared affection that comes from spending 25 years in each other’s company. Jerome Robbins’ choreography, recreated by Matt Cole, feels particularly thrilling in this small space; the scene in which the villagers end up in a whirling, wary, but eventually celebratory dance with the Russian cossacks is an energetic highlight. While some of the playing is broad, Nunn’s production is rich and resonant, and the drawn-out last scene in which the villagers are forced out of their homes is as potent a reminder as there ever was that life is precarious.